To see the old links as written way back when, click on this link. The following URL's were gleaned on December 7, 2003, by scanning my entire Bookmark file and then, in January 2016, scouring the WayBack Machine for links to the lost sites. Those are the ones where the destinations don't match the text you see here. If the abstracts seem incomplete, that's because I decided to publish them sooner rather than later. These sites are too interesting to be simply rendered like common soap. KomPozer can't handle tables this big, so there are several additional pages: Go back to Page 1. Page 2; Page 3; Page 4; Page 5; Page 6; Page 7. Sandy Moss, recently retired marine biologist, has been studying and redistributing old tools for many years with grace and good humor. His historical brace collection is a superior resource, as is the informative diary of his many visits to the Brimfield, Massachusetts antique market, held several times each year. Also, check out Sandy's list of links. Sandy makes an art of describing how and what to eat of a New England lobster. Ralph Brendler maintained a number of studies of tools, including marking & mortise gages (especially Stanley gages, and patented gages) and also specialized in making shaker boxes, as well as making some other interesting things with old tools. The Wayback Machine last captured Ralph's brendlers.net webpage in 2007, when he was a steward for DATAMP. This link is arranged the other way around, as Christopher Swingley is alive & well and living in Alaska. Chris maintains the Oldtools Mailing List Archive, a fascinating and wide-ranging blog of book reviews, weather and personal health monitoring and getting around the business of everyday life and Information Technology in Alaska, as well as interesting tool-making projects, photographs of wild Alaska, a treatise on Netiquette, and even a table of all the HTML escape codes for useful symbols. Chuck Zitur died of esophageal cancer in 2005, a great loss to his family and also to the Galoot world. When LJK and I drove her car from Pasadena, California to southeastern Pennsylvania in the smoky Summer of 2000, we made a 1,500-mile detour through Billings, Montana to meet Chuck and his family, which turned out to be a once-in-a-lifetime experience. It came out that Chuck & I had similar old tools behaviors: Chuck had just cleaned big piles of antique tools out from underneath and on top of most of his dining room table in anticipation of the visit ... and I had done the exact same thing in anticipation of LJK's coming to live with me. The WayBack Machine has captured all but a few images in Chuck's fine webpage. See especially: Meister and Schlingensiepen 1928 Tool Catalog, Geared Drills, Patents, and the very humorous & ironic Duplex Drill, which completely explains the origin of the technical term, "eggbeater drill." Originally created as A Millers Falls Home Page, Randy Roeder has pooled all his royalties from the many instances of eBayers' copying of his catalog-page reproductions to start OldToolHeaven.com. It's not just a collection of catalog images, but it's also a history of the evolution of the Millers Falls tools and their designs. Interestingly, Millers Falls never patented the roller support for the main gear on their No.2 drill, and also never showed a picture of that device in any catalog. Tom Price exhibits unfailing good humor & insight in The Galoot's Progress, especially his flea market primer (to which I can add: Don't ever put a tool down if you are thinking of purchasing it, or Todd will grab it), A Better Eggbeater, an excellent way of Restoring Auger Bit Lead Screws, A Brief History of Elliot Storke and the Auburn Metallic Plane Company, Steve & Tom's Excellent Adventure, a chuck-full toolchest of his own making & filling, an historical list o'links, including the original annoncement of the creation of the OldTools list, an accurate description of tool heaven (I've been there; Tom wasn't hallucinating; alas, Elmer gave it up, but the building is still there), a link to Romeyn B. Hough's Treatise on American Woods (not the forests, but what the trees are made of), and much more. Still in its birthplace, the Diretory of American Tool and Machinery Patents continues its role as the preeminent resource for finding patent data in the pre-1976 era, before the U.S. Patent & Trademark Office started indexing patents by their content, rather than just by the patent number and an arcane classification scheme. Volunteers are always need to donate patent information and time for filling in the blanks. Another great resource, the Collectors of Rare And Familiar Tools Society (of New Jersey - but don't expect to find another one ...) holds several important events, especially its Spring Tool Auction, monthly tailgating/tool-talk meetings, and an Annual Picnic each September, publishes the Tool Shed with scholarly articles on many avocations, articles on New Jersey toolmakers, and an excellent list of External Links. This discussion list was the product of Jeff Joslin, the Official Historian of the Old Woodworking Machines, and was devoted to the histories of a great many companies that made woodworking machines, such as American Saw Mill Machinery Co., American Woodworking Machinery Co., Astro Wood Planer Co., Inc., Atlas Press Co., W. F. & John Barnes Co., Belsaw Machinery Co., Berlin Machine Works, Berry & Orton Co., and so on. Jeff can still be reached through DATAMP where you will find Jeff's Old Woodworking Machines site reborn as a nonprofit. Mike Taylor closed this shop in 2006, but when it was in business, Mike made reproduction plane handles and refinished woodworking planes. He also had a short list of links to other plane specialists. Wood Central has, among other topics, forums on Turning and Hand Tools. In the latter category there is a list of links on the subject of Antique Tools. Alas, the Stanley Works has been engulfed by a conglomerate, and the present website is next to impossible to navigate (except by Live Chat) if you are looking for plane or brace parts. Lori may actually still be there, though. Maintained in American Artifacts by Richard Van Vleck, the website covers a wide range of farm-related items, medical quackery, etc. and also has a nice page of scholarly articles. Richard also has nicely documented a Barnes No.5 velocipede-powered metalworking lathe that he sold some years ago. 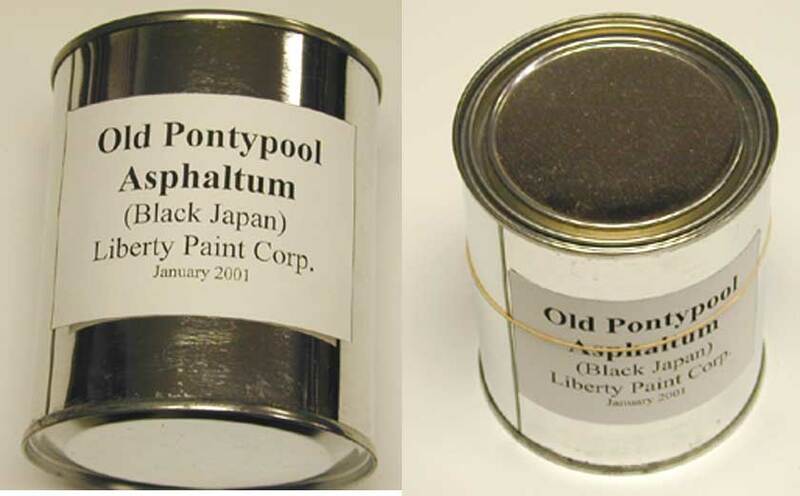 Pictures of an asphaltum-based black lacquer that should be great for refinishing Stanley planes, breast drills, etc. called Old Pontypool Asphaltum. http://pages.prodigy.net/bwitcher/bostontrader.html Joe LaBrie maintained this short website to sell old tools, but he died in 2012; the site is still useful to see what stuff cost in 2001. Maintained by Larry and Carole Meeker, specializes in mechanical antiques. They also keep an archive of past sales, useful for seeing what your own stuff might be worth to a willing buyer. See also their lists of currently available items, such as drills and other edge tools, patented wood and metallic planes, even Stanley planes, and a wide variety of miscellaneous old tools. Auger Bit Files among many other woodworking and hand tools. Auger Bit Files - alas, no more from this source, even in 2009, by which time the site owner's suppliers had mostly evaporated, leaving Grobet, but no auger bit files. VintageSaws.com is now devoted entirely to carpenters' saws. Auger Bit Files, also an amazing maker of hand tools for all purposes. Auger Bit Files, amid a wide variety of woodworking tools. Wow ... antique watchmakers machines, before they all started to look the same. ... Ahem ... another Old Tool Heaven, created in its time by Gary Johns and devoted to old tools of the Galoot sort. Plus some old links to Galoot websites and to Reference Sites. Everything about blacksmithing ... still. Tony Seo's excellent webpage, mostly devoted to hand tools that one doesn't see every day. See especially Tony's pages on Old Trades, another page on Workbenches and Treadle Lathes, a number of Links, and Pennsylvania Furniture. Now hosted on its own website, Roger K. Smith Antique Tool Catalogs, and still magnificently reproduced. As above, now in its own domain as seen in the next row of this table. Jon Zimmers antique tools of all varieties for sale. The Superior Works, home of Patrick's Blood & Gore. Also home to a monthly list of tools for sale, offered on a take-it-or-leave-it basis, as hesitation means lost opportunity. Even new tools, including Mr. Leach's own Bedrock #601 plane, and Et Cetera, not to be missed. David Zeitman's lists of woodworking planes, tool catalogs, rules, machinist tools, and a few links to sources of tools. One of those links pointed to Delphion.com, a patent search site that was gobbled up in early 2001 and turned into a money-maker. a.k.a. Falcon Wood, a source for a wide variety of antique hand tools for use by various trades, including just you & me.There is a large selection of Stanley tools. A great place to visit, albeit subject to damage by flooding from unusual weather events that are becoming more unusual ... but then, it once was a water-powered mill and it's in a historically significant building. There are many awesome old machine tools (I've been there !). Do you want cut nails for just about any purpose ? Here's who still makes them with machines that have been working for 100+ years. Also there are all your questions answered here. Grandpa's Tool Chest, last updated in 2003 and defunct by 2009. Used to have a sales booth at the Cambridge Antique Market. Maker of machinists (and a variety of other) tool chests. Beware of sticker shock; Gerstner is the gold standard of quality, however. Ron Hock's authoritative notes on the sharpening of handsaws, recently gussied up. Interesting list of links to many tool sources. Ron's current webpage still has the short version of the sharpening notes but now Ron offers a book-length treatise. Jay Sutherland's chart facilitates identifying what type of Stanley plane you have. Bob Key's Woodworking Shop, with excellent Corel drawings of his shop layout, a series of nicely made workbenches, a very helpful section on questions often asked by beginners, another section on how to get started in woodworking, and some quite practical tool storage cabinets. Publisher of books on antique tools & trades. Also distributes the text-searchable EAIA publications, Directory of American Toolmakers (on a CDROM) and the Chronicle of the Early American Industries Association (on a DVD covering Volumes 1 through 60). Website of the Museum of Woodworking Tools, curated by Robert Mathison. Amazing twenty-seven page list of links and the important Permanent Collection of material on tools & tradesmen. There's even a store with some hand tools, but mostly stuff for power tools. Dealer in catalogs of all kinds; last active ca. 2003. Many tool catalogs listed. Webmaster's interesting personal commentary on his blacksmiths' post drills. Interesting plans for a medium-sized workbench, notes on the building of a bench, and other stuff from 1998 by Tony Seo. Mid-West Tool Collectors Association - The site map reveals a very useful set of sample articles, marked "deprecated" but the link leads to the right place, where Ron Pearson's Database of American Patented Drills is stashed at the very bottom of the page. There are also two pages listing a great many tool dealers, another page with a tutorial on the places and how-to's of patent searching,the calendar of the association's upcoming events,and a listing of Special Publications, each being a yearly reprint, usually of a rare tool catalog. Database of new planes from the Stanley Works and other vendors.